or may not remember from our German(ic) Symphonies series, the end of the 19th century and beginning of the 20th brought us an era of overwhelming music in both content and scope. Starting with people like Wagner and Bruckner, harmonies and sounds began to change, and people like Mahler picked up the baton (literally and figuratively, I guess) and pushed the symphony to its very limits (the third and the eighth of Mahler come to mind), and this bubble of incredible and massive growth had to burst. As early as the 1880s there were people already kind of… In quiet but strong opposition to the bigness. Erik Satie, a later friend of Claude Debussy, wrote teeny, delicate, harmonically interesting and very beautiful piano pieces. The harmonic style of the impressionists was a direct result of the advances that Wagner put into motion. But wholly more than that was Schoenberg himself, who adored the Romantic idiom, admired Mahler greatly, but kind of topped out the limits of the Romantic ideal with Gurrelieder. Go back and read that article for my thoughts on the piece. In short, he took a long hiatus from the work after he’d started it, and in that interim, had a bit of an epiphany, eventually coming back to finish it with an entirely different outlook on music. I see his determination to finish the work as a purging of everything left from that part of his output so he could move on. My goal: complete liberation from form and symbols, context and logic. Away with harmony as the cement of my architecture! Harmony is expression and nothing more. Away with 24 pound protracted scores! Lean! In two notes, not built, but “expressed”. This multicoloured, polymorphic, illogical nature of our feelings, and their associations, a rush of blood, reactions in our senses, in our nerves; I must have this in my music. It should be an expression of feeling, as if really were the feeling, full of unconscious connections, not some perception of “conscious logic”. Now I have said it, and they may burn me. The technique is a means of ensuring that all 12 notes of the chromatic scale are sounded as often as one another in a piece of music while preventing the emphasis of any one note through the use of tone rows, orderings of the 12 pitch classes. All 12 notes are thus given more or less equal importance, and the music avoids being in a key. For an example of why this is important or useful, consider again Schoenberg’s op. 11 (a piece we shall get to in this series for this month). Separate musical analyses from highly-respected professionals result in claims that the piece is in any number of different keys. With a definitive system for using all the tones (pitch classes) equally, that can no longer be the case, even though the 12-tone system can be used to emphasize certain intervals and even create “tonal” harmonies, although this is usually either specifically avoided or produced, not often coincidental. 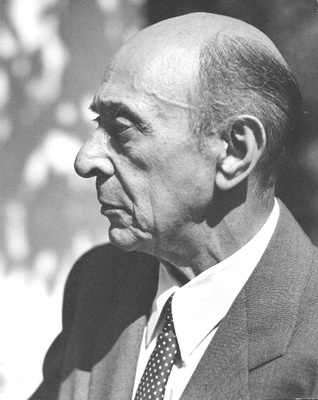 So it could be said that Schoenberg was one of the first to remove himself from the Romantic music machine and get to work on something radically different (or more precisely that he was eventually the first to develop a systematic method for doing so), although, as history shows, those decisions come with at least some degree of kickback, and Schoenberg’s certainly did. But that’s for a later time. < In any case, he developed his system, and there are a few milestones in his output. The fourth movement of Schoenberg’s second string quartet bears no key signature and is perhaps his first “freely tonal” work. If you had to pick a point in Schoenberg’s career where tonality broke down, that would perhaps be it. Op. 11, the work that follows, is, as described before, also “freely tonal,” but it seems it wasn’t until his op. 23 a decade or so later that a definitive systematic approach was brought to his compositions. I am realizing at this point that the general idea in my head for how to explain this is much larger than one article. Let’s leave this one here for now, and get to explaining the twelve-tone technique as well as learning to love it in later parts. To summarize: Arnold Schoenberg was a die-hard fan of the Romantic idiom, and could write in the idiom as well as anyone, as shown by the monstrosity that is Gurrelieder. Works like Verklärte Nacht and his first two string quartets show that he was pushing the limits of traditional tonality to the breaking point. He pushed harder. First came a “free tonality” with no tonal center, and then was developed the (in)famous twelve-tone system, which two of his students picked up on, thus establishing what is known as the Second Viennese School. More would follow, but they aren’t considered necessarily official ‘members’ of this ‘school.’ It’s repulsive for some, a novelty for others; interesting to some, passionate and inspiring to yet others. We’ll talk more about the actual details of the twelve-tone technique in our next (shorter) article.